Wheatgrass remains one of the hot “flavors of the month” in health food circles, so it is time to separate fact from fiction as this latest superfood is critically evaluated. Whenever a substance like wheatgrass takes off in popularity, it can be assumed that it does indeed have some benefits and few harmful side effects. That is the case with this green vegetable. In short, wheatgrass has proven to be a popular element in juices and tablets because it gives you a lot of the zing of other green vegetables with far less trouble and iffy taste. 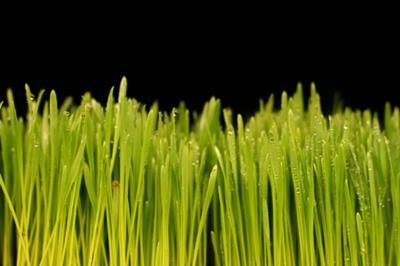 •	Wheatgrass is essentially a young wheat plant that is harvested early, while at its peak nutritional value. As the wheat plant grows further into a stalk, its concentrations of chlorophyll, protein and vitamins declines rapidly. Wheatgrass often comes in the form of a juice or powder, which is mixed into other drinks. It can also be purchased in tablet form or as produce. •	Wheatgrass has about the same amount of vitamins as an identical serving size of dark leafy greens, but with a superior taste, in the opinion of some. It also is much more easily consumed as a powder mixed into a drink or as it is juiced into a nice beverage. The trade-off with drinking wheatgrass as opposed to eating spinach, for instance, is that a person does not gain the benefits of fiber intake. •	In terms of raw numbers, a 2-oz. shot of wheatgrass gives about 10% of the daily requirement of vitamin E and about 20% of daily iron needs, making it a fairly good choice for vegetable intake. Wheatgrass does contain much higher amounts of vitamin E than comparable quantities of spinach or broccoli. •	Chlorophyll might have some connection to reduced incidence of colon cancer, initial studies show. This is how wheatgrass has earned a reputation as a cancer fighter. In addition, a famous 2007 study in Israel reported that a daily 2-oz. shot of wheatgrass juice reduced the blood toxicity that results from chemotherapy. This phenomenon will be studied further, but these results explain why wheatgrass often pops up in diets for cancer patients. •	The information surrounding the supposed miraculous benefits of wheatgrass is sketchy, not because it is hard to study the substance, but because few researchers have focused on it in their work. So far, the hard truth about wheatgrass is that it is a very healthy vegetable but no miracle cure. •	Like other vegetables that are rich in oxygen and enzymes, wheatgrass can be said to boost your immune system by purifying the bloodstream. Again, this can be said of many foods, but if you enjoy the flavor of wheatgrass in your juice, seize the opportunity to consume it in beverage form. •	When grown indoors in homes, wheatgrass can achieve a high nutritional content in just 10 days. In conclusion, wheatgrass is a wonder—it can give you a nice vitamin and iron punch in a much more pleasant form if you do not favor spinach or broccoli, to pick on two members of the green vegetable family. Its nice taste in juice form can be a quick and easy way to fortify your body without taking the time to cook broccoli or eat it raw. Remember, however, juice does not give you the fiber benefits of a vegetable tray full of broccoli, although for some people that is a good thing. About the Author: The article comes courtesy of HealthPost, an online health store covering a wide variety of natural health products, including Coenzyme Q10. For more information, visit their website.